snapshots of my family life – mostly on the road. InshaAllah, our first follow-up session will be this coming July 19 (Sunday) at Nuin Cafe, BBBangi. 3:30 – 5:30 pm. 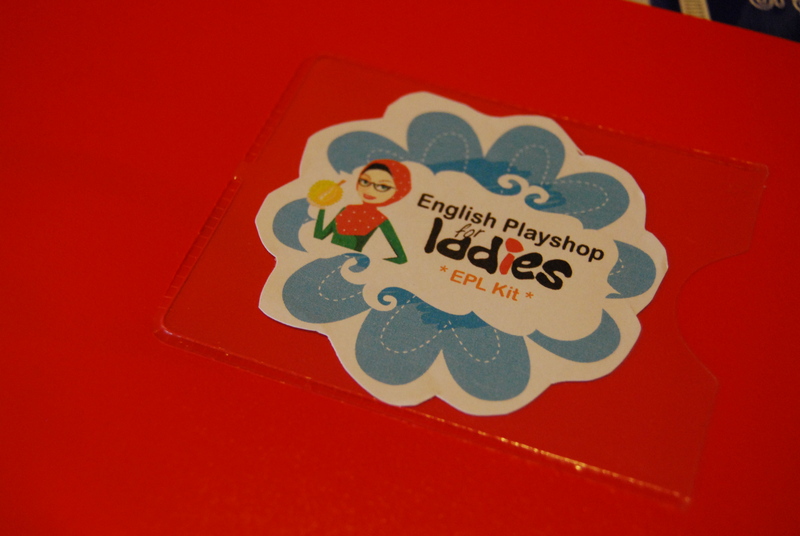 Please bring your EPL Red File – we’ll practice and ‘perform’ Readers’ Theatre together! Yee-ha! More info coming on mycoachingzone.net. Coming this October! Another round of EPL for those who missed the fun last month. My business partner and I conducted a mini-ESB seminar yesterday at Kompleks PKNS Bangi. Took the opportunity to promote October EPL. At noon Saturday, we’ll be there to organize English Zone Challenge for kids and teens (maybe adults). Main Stage, Kompleks PKNS Bangi. 12 noon – 1:15 pm. My job involves speaking and ‘performing’ to kids, teens and sometimes adults. My sparring partner has always been my better half, Ridz aka Abi. That’s how we make our living so far, alhamdulillah. However, two weeks ago, I had two new sparring partners to accompany me on stage. Hahahaha my backup singers…muahahaha… Muhammad and Musa. We performed a Readers Theater, “Small Red Fish, Big Blue Fish”. 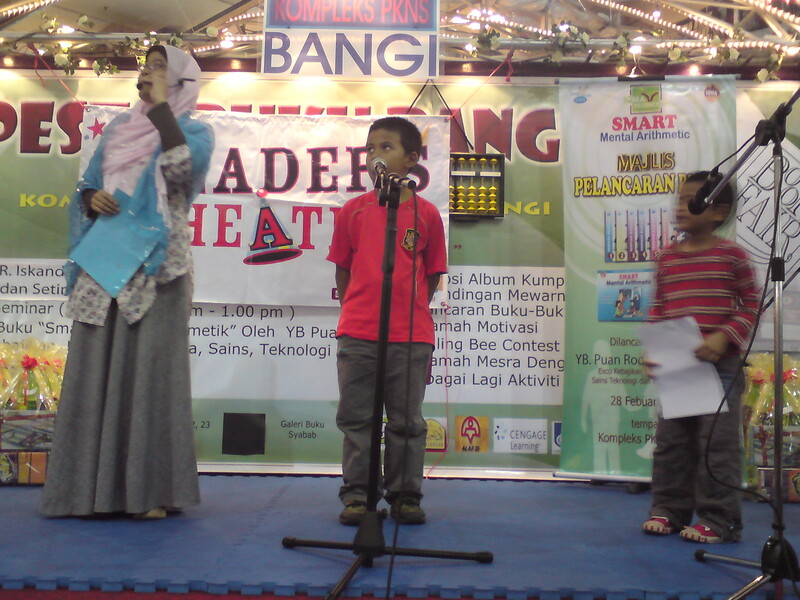 Musa was the narrator, Muhammad became the small red fish, and yours truly the BIG fish. 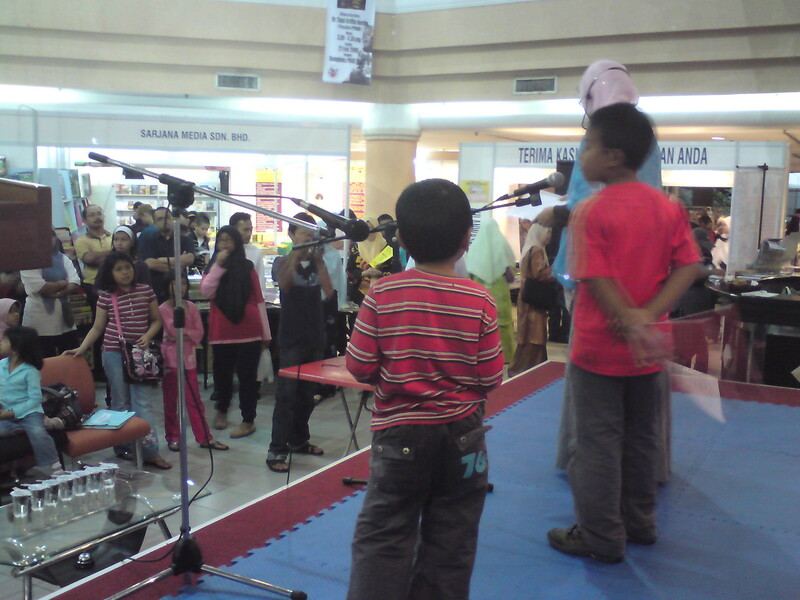 The event was Karnival Generasi Berilmu (KGB), held in Kompleks PKNS BBBangi. It was supposed to be a storytelling corner but I changed the concept to Readers Theater (RT). This is a popular activity to encourage literacy and love for reading. Come on…storytelling, sorang je bercerita, RT ramai-ramai atas pentas. No need to memorize scripts, no need for props and costumes. Just a script and play with your voice and intonation. Easy daisy! The audience (parents & kiddos) and the crowd were sporting and supportive. I couldn’t resist making them play rock, paper, scissors and sad, mad, glad. The best thing was…they participated. Coooooool!!!! This blog is about homeschooling. Our children (Muhammad, 14, Musa, 13, Maryam,11 and Sarah, 8) are exposed to learning & tarbiyyah at home, in the van, on the road. The world is their classroom. Their teachers are Abi & Umi, Tok Wan, Tok Wen, Opah, Sensei, their tutors and coaches, all the aunties and uncles in our big family, our friends and people from all walks of life. Alhamdulillah, a new roadschooler has arrived :) Khadeejah, 1.6 years. We don't subscribe to a particular theory - what Islam has given us is simple and specific enough. Enjoy reading!